Painting of a new mural on Tsa La Gi Trail is underway in south Fayetteville. City officials on Thursday celebrated the completion of the Lake Fayetteville trail boardwalk at a ribbon-cutting ceremony held just west of the Botanical Garden of the Ozarks. The Lake Fayetteville dam will look a little different by the end of the summer. Fayetteville City Council members next week will consider a proposal for new public art on the city’s trail system. 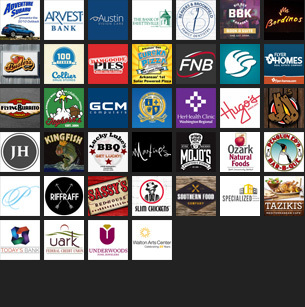 It was a great day for the annual Square to Square bike ride from Fayetteville to Bentonville. Registration is underway for the second annual Ladies DU Fayetteville, the city’s women-only duathlon. Volunteers are needed for an Earth Day celebration this year that includes a trail and stream cleanup event in Fayetteville. Fayetteville officials will celebrate the completion of 0.75-mile extension to Clabber Creek Trail during a ribbon-cutting ceremony scheduled for 3:30 p.m. Thursday, April 6. Volunteers are needed for two trail building events scheduled this week in Fayetteville. Fayetteville officials are looking to hire an artist to paint a new mural along the city’s trail system. Trail users in Fayetteville and the rest of the region may have noticed several new wayfinding signs that were installed along the Razorback Greenway earlier this month. Another round of volunteers are needed to help clear the trail corridor where a 19-acre mountain bike park is planned in midtown Fayetteville. A damaged section of Frisco Trail will undergo repair work next year thanks to $56,000 in federal-aid funds. The new rule would not apply to anyone traveling on foot, but hikers, joggers and dog walkers could also benefit from the proposal. We began our hike working clockwise around the Lake Fayetteville from the east side of the parking lot at Veterans Memorial Park. Trail users now have a safer way to get to two major shopping centers in Fayetteville. A portion of Scull Creek Trail will be closed from Gordon Long Park to Appleby Road during the day for about two weeks while city crews work to stabilize the trail foundation and prevent erosion near the creek. A new public bird blind on the eastern shore of Lake Fayetteville opens this week. Pedestrians and cyclists in west Fayetteville will eventually have a safe way to cross Interstate 49, but it won’t come without a significant cost. One of Fayetteville’s oldest trails will soon have lighting thanks to a grant from the Arkansas State Highway and Transportation Department. 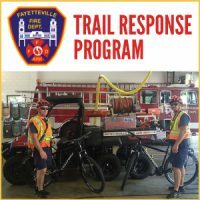 The Fayetteville Fire Department this month announced the creation of a new program to help with rapid medical response and search-and-rescue efforts on the city’s growing trail system.